Sir Michael Sevenson and his squire Fisk can’t seem to keep out of hot water. What can you expect when you embark on a career of knight errantry? That both our boys are having serious family issues doesn’t help. After five long years, Fisk has been called home to Ruesport by his sister Anna—not for a family reunion, but to investigate who framed her husband, Max for blackmail. Anna figures that Fisk with his criminal past was uniquely qualified to find out who set Max up. Of course Michael feels he has to come along to help his friend, but now he wears the tattoos of the unredeemed courtesy of his father and has experienced unpredictable magical abilities ever since Lady Ceciel conducted her experiments on him, and Michael fears he might not be more hindrance than help. 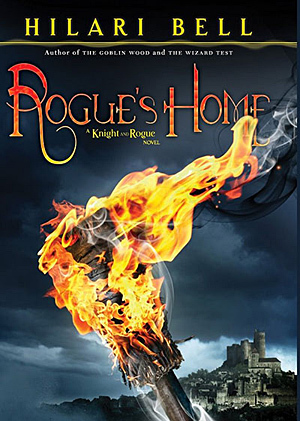 As in THE LAST KNIGHT, Hilari Bell’s first Knight and Rogue novel, ROGUE’S HOME combines the banter of a buddy story with elements of classic fantasy, medieval daring do, and mystery. Michael and Fisk are likable guys who just seem to be magnets for trouble. You never know what is going to happen to these would-be heroes next!